As incredible as it may seem now, there was a time when the pit bull terrier was the quintessential icon of American family life. Think "Pete the Pup" from the 1950's TV show The Little Rascals. Think "Tige", the dog in the Buster Brown shoe advertisements. 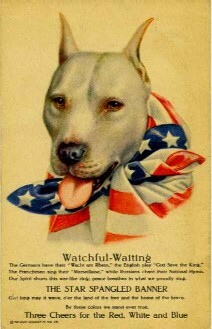 The WWI propaganda poster on the left, entitled "Watchful Waiting" depicts an American Pit Bull Terrier literally wrapped in the American flag. In fact, it was during WWI that a Staffordshire Bull Terrier named "Stubby" became the most decorated canine war hero in U. S. history and the only one to be promoted to the rank of Sergeant through combat service. With his superior scenting and hearing capabilities, Sergeant Stubby was able to warn his unit of poison gas attacks, incoming shell raids and other dangers. He located wounded soldiers and was wounded himself on several occasions. He was also credited with being solely responsible for capturing a German spy. After the war, Stubby lived out the remainder of his life his with owner/handler John Conroy. From 1922-23, he was the Georgetown University mascot while Conroy was enrolled there as a student. In 1926, Stubby passed away. He died in Conroy's arms and his remains are preserved in the Smithsonian Museum. He is shown here during his Georgetown days. Now, fast foward to today when the pit bull is without question the most feared and hated of dogs. In the span of less than a century, these dogs have gone from war hero to media darling to public enemy number one in the mind of the American public. Breed specific legislation is spreading at an alarming rate across the U. S. and in other countries. In some cases, pits can be confiscated from their owners and destroyed with no evidence of dangerous tendencies. In many other instances, the restrictions and requirements placed on pit bull owners are so onerous that some feel they have no alternative other than to surrender their family pet. Pit bulls aren't the only dogs that are negatively impacted by breed specific legislation. In the 1970's, German Shepherds were the main target. In the 1980's it was Dobermans. Rottweilers have also been vexed by this cruel form of predjudice. But, even smaller breeds are not safe. At one time, Italy had black-listed 92 breeds--including Welsh Corgis. How did a creature that was once so beloved fall so far out of favor that some people want to make it extinct? I've thought about this long and hard and the conclusion that I've reached is that there is plenty of blame to go around. There have been rampant inaccuracies reported by the media which have fueled public hysteria. There are local government officials who barely gave lip service to enforcing animal cruelty laws, funding pet care education or supporting spay/neuter programs in their communities, but now want to ban pit bulls. And, there are the irresponsible breeders who sell badly bred pups to anyone who can scrape together a few hundred bucks. All too often these pups end up with dog fighters, gang members or people who are just plain clueless and careless when it comes to raising a dog. But, while we're busy placing blame, the future of these dogs hangs in the balance. The bottom line is that the public perceives that pit bulls are more likely to bite than other dogs and more likely to do damage when they do. As long as that perception prevails, these dogs are in danger. If you know and love a pit bull or would just like to help, here are some things you can do to make a difference. Be a responsible pet owner. Obey leash laws, keep shots up to date and any registration fees paid. Obedience train your pit bull. Let him be an ambassador for bully dogs when in public. If you have the time and interest, participate in dog club activities with your pit like agility, pet therapy or search and rescue. Again, it's good PR for these misunderstood dogs. Please spay or neuter your pet. Beautiful bullys are dying every day because there just aren't enough good homes for them all. And, that's true not just for pit bulls, but sadly for all dogs. Oppose breed specific legislation. Educate yourself on the issues and then educate your local officials. Show them there are sane, effective alternatives that "punish the deed, not the breed". Teach bite prevention to your children and any children who come into your care. Dogs are ubiquitous in modern life and children are the most likely victims of dog bites. Volunteer at a local rescue or shelter that supports and facilitates pit bull adoptions. I really believe that with enough people working together, we can restore the pit bull to its original nobility and worth in the eyes of the public. And, it is to that end that this site is dedicated.